Frank Schmidt concentrates his practice in the areas of estate and business succession planning, commercial real estate acquisitions and leases, general corporate and business transactions, and lender representation. The litigation portion of Mr. Schmidt's practice is concentrated mainly in the areas of trust and last will disputes and litigation, commercial litigation, banking litigation, contract disputes and landlord/tenant disputes. Mr. Schmidt's clients consist mainly of privately owned businesses and their principals, as well as banks, trust companies and other financial institutions. 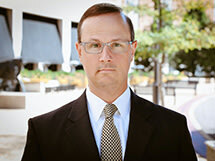 Mr. Schmidt earned his law degree from St. Louis University School of Law in 2000, and is licensed to practice in the States of Missouri and Illinois. When not practicing law, Mr. Schmidt is frequently asked to speak and co-present business and estate planning seminars with financial planners and insurance brokers.